I am a big fan of herbal teas. There are so many wonderful tea companies out there now with the most beautiful aromatic and exotic combinations of tea. I often turn to herbal tea in my me-time. That quiet time that I put aside to just relax and chill out. In fact, the act of drinking tea by sitting quietly and being mindful of the moment is one of the simplest ways to bring the feeling of overwhelm and busy-ness back a touch. 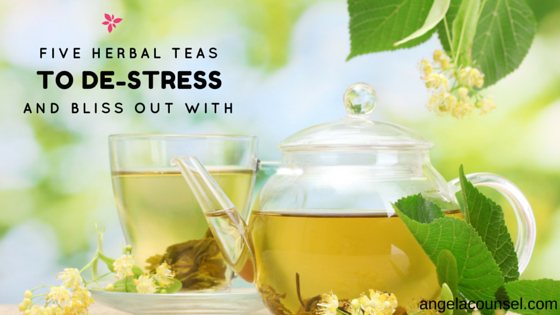 Here are five herbal teas that will help with stress. Their secret power is in treating the physical and emotional ailments that stress causes. And if course the act itself, as I mentioned itself, of brewing and sitting and sipping, will bring that blood pressure down and slow down that mental to do list spinning around in your brain. Always a crowd favourite and a popular herbal tea among the masses, chamomile helps people suffering from indigestion, insomnia and nausea. It’s a good one to have before you sleep. Licorice tea is a bit of a multi-tasker. It helps ease PMS, lowers blood pressure and helps the liver neutralise toxins. Licorice tea is also a mild laxative so can help if you suffer from constipation. Be wary of how much you have if you don’t! It also has anti-inflammatory properties. Ginseng is great for people suffering from insomnia, nervouse exhaustion and stress. It is a bit bitter though so either mix it with other more palatable herbs or choose a herbal tea product that has ginseng in it mixed in with other herbs. Another favourite, peppermint helps heat up the body a little and release toxins. The minty taste also makes it a little more palatable than some of the other herbs. Recognised as a bit of a superpower tea, green tea has long been a go to tea for generations. With it’s anti-oxidant and anti-inflammatory properties, it is said to help people with high cholesterol, high blood pressure and diabetes. Green tea is fantastic for helping with prevention of chronic illnesses and ailments. It’s important to remember that some herbs aren’t right for all people, so speaking with a qualified naturopath or herbalist is important before you decide to try anything out of the usual. I certainly understand why the Japanese have held tea-drinking ceremonies for thousands of years. The art of tea-drinking, the process of creating the perfect brew and then the act of drinking delicious tea with wellness properties is certainly something to savour and celebrate.